Watermelon smoothies are a bit different from other fruit smoothies since watermelon has an extremely high water content. If you don't know how to make a watermelon smoothie correctly, this can result in a watery smoothie with little flavor. To combat the watery smoothie problem, we pre-freeze the watermelon for this recipe. You could make this smoothie with fresh watermelon and crushed ice instead, but it will have a juice-like consistency, not like a milkshake-like texture, which most people prefer. When choosing your watermelon, look for a seedless variety to make your life easier. If you can't find seedless watermelon, take the time to pick out the seeds before you freeze the fruit. Once you start on the cutting of your watermelon, do away with the peel completely and cut the flesh into small chunks —the smaller the chunks, the easier it is to blend this watermelon smoothie. Serve smoothies in chilled glasses. For garnish, place a few wedges of watermelon aside when cutting your watermelon. A sprig of fresh mint will add a pretty pop of green once you are ready to serve. Cut watermelon into small chunks. Make sure watermelon chunks are fairly small - about 1/2-inch to make chunks easier to blend into the smoothie. Line a cookie sheet with waxed paper. Place fresh cut watermelon on the cookie sheet, leaving space between the pieces. Cover with plastic wrap and freeze for 1 hour. Or if preparing the watermelon in advance for smoothies later in the week, transfer to a plastic storage bag and freeze until ready to use. Place frozen watermelon chunks in a Vita-Mix Blender (compare prices) or a regular blender. Top with milk, yogurt, then maple syrup. Blend until smooth. 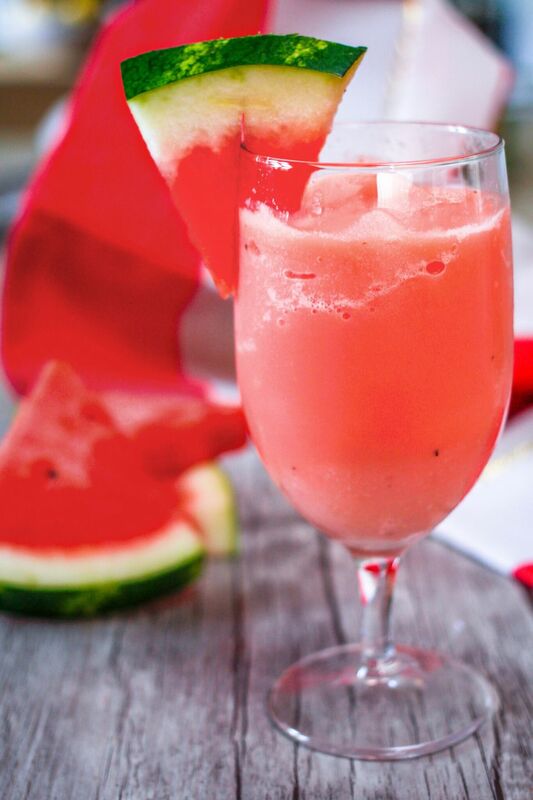 Serve watermelon smoothies immediately, using chilled glasses. Garnish with a wedge of watermelon and fresh mint, if desired. Quick Cleanup Tip: Quickly flush out your dirty blender the best you can use the faucet. Then fill the blender halfway with hot water and some dish soap. Return blender to its base and turn it on high for 20 seconds. Rinse thoroughly with water and you are done.